* $75.00 Cleaning fee not included, this can be left at the house upon departure. Whether you play golf, tennis or quilt, this house and its location have much to offer. In the quaint town of Heartland, NC there are over 40 local golf courses, potteries, shopping and restaurants. Treat yourself to breakfast at Pinehurst harness track and fair grounds. You can even spend the day relaxing at the world class Pinehurst Spa or have a drink on the porch at the Carolina Hotel. You will have access to three swimming pools and the beach/marina, which are only minutes away. 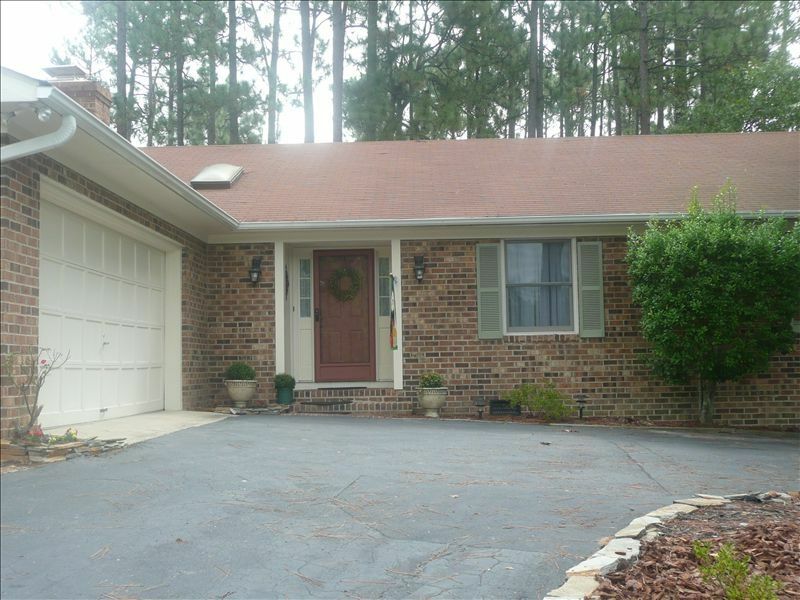 This home is a great rental for families or friends traveling to Pinehurst. We needed extra room for our adult children and their families. The home is clean, has great seating, amenities, and is very relaxing and comfortable. The master bedroom is spacious and the other bedrooms are welcoming. The hosts. Cyndi and Jim, were great to work with. We will definitely rent this again when we have family in town. We didn't use the whole house but certainly will when the weather is warmer. Thanks for a great family time! Comfortable bed, plenty of room, (in fact, I kept forgetting how to get to the bedroom), quiet neighborhood. We did some cooking breakfasts, and grilling steaks and found the kitchen to be well supplied with the needed equipment. Owners seemed easy to work with, even though I wasn’t able to contact them through vrbo and had to use email. Enjoyed the interesting little town of Pinehurst nearby. Southern PInes area has to offer. The owners are great to work with and again couldn't ask for better service. This was our second visit to this property and it will not be our last. Please give it a try. You will not be disappointed. The check in process was so easy and laid back! So very helpful! Even though I have never met her I can tell she is a very caring person! We would definately stay here again if we were ever back this way! This house had everything! Even a hand mixer! We enjoyed our stay in July. The house was very clean and had all the amenities we needed. Loved the skylights and lounger on the porch! We would definitely stay here again.